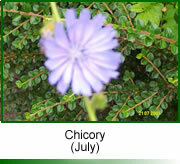 Chicory (Bach Flower Remedy) is one of the 38 Bach Flower Remedies. Bach flower remedies are selected based on the emotions a person is experiencing at the particular point in time at which he or she uses the remedies. 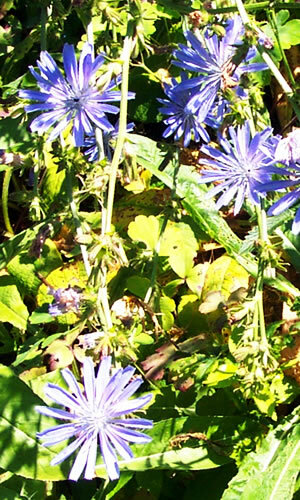 The chicory Bach flower remedy is categorized in the 'over-care for the welfare of others' group of remedies, which also includes vine, vervain, beech and rock water. Many books about Bach Flower Remedies suggest that most people can benefit from them at some times and/or during certain types of circumstances. The main question at any particular time is which of the remedies is appropriate for the specific person (or animal) at that time, remembering that the choice need not be of just one remedy. Although it is possible to use only one remedy at a time, a small group of remedies is often selected and used together. See also the main IvyRose Holistic section about Bach Flower Remedies, which is part of the Therapies section of this website. Further information about Bach Flower Remedies includes a list of the Bach Flower Remedies, a list of the Latin names of the Bach flowers and notes about the history of the Bach Flower Remedies.